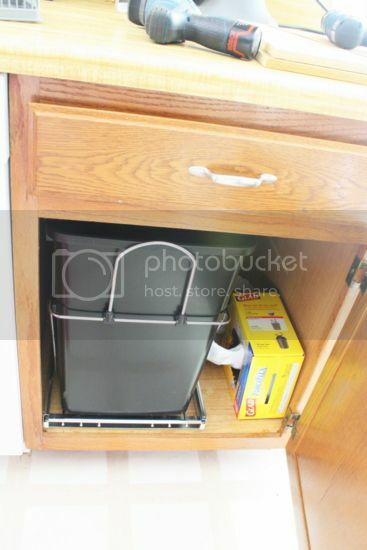 We recently turned an empty cabinet in our kitchen into a trash can cabinet so we could have a hidden trash can. It has made such a difference, and I can’t believe we didn’t do it sooner! I shared on Monday that we did a pantry door update to create some more storage and make our lives a little bit easier. And today, I’m sharing another little project that’s going to make a big impact – and it just so happens to also be in the kitchen. NOTE: We did this project again in our new home with a larger cabinet area. 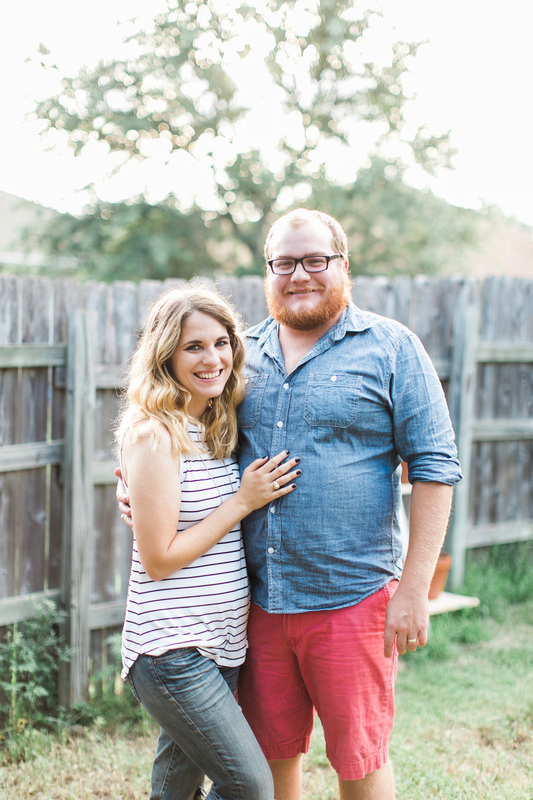 Check this post out for info on our other hidden trash can project! 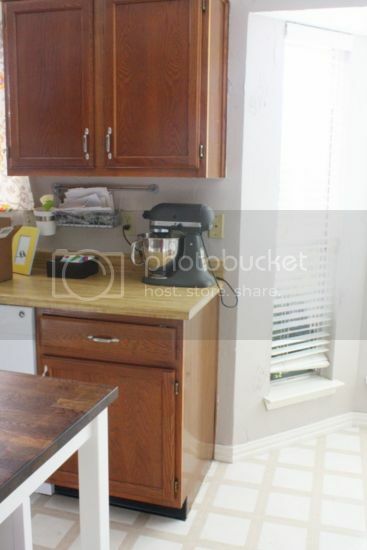 Let’s start out by looking at the “before” – we have an ugly plastic (tiny) trash can, and an empty cabinet right next to it (it’s empty because we had been planning on doing this project and just hadn’t ever gotten around to it). 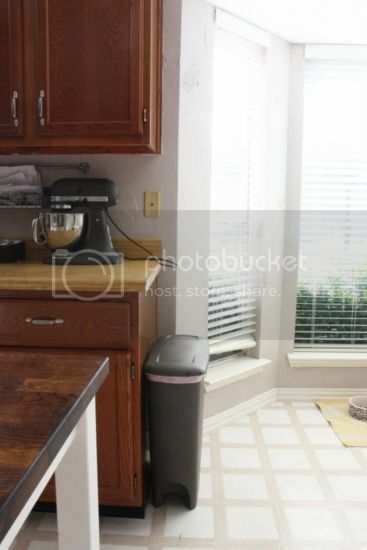 So, yeah, we’ve wanted a new trash can for a while now, but we didn’t just want to replace this trash can with a larger, better-looking one – we really don’t have room for a larger trash can, and we’d much rather find a way to hide it anyways. So, we decided that an in-cabinet trash can was the way to go. And while we were at it, we figured we could get two so we can start recycling. 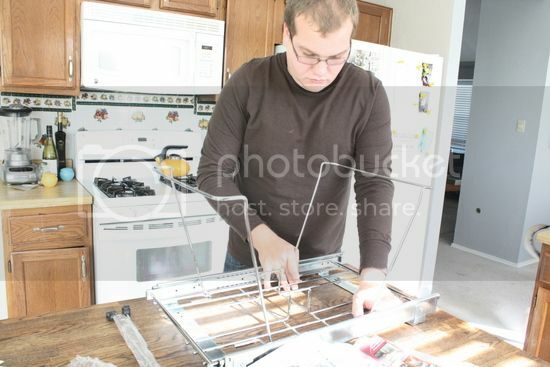 We debated building something ourselves and even did quite a bit of research on how to build a pull-out trash system for cabinets, but we had a hard time finding actual trash cans that would work with a self-built system. When we found an affordable system that came with two trash cans, we decided to just go pre-made on this one. It just so happened to be on sale this weekend, so we snatched it up and installed it Sunday afternoon. And oh my goodness, I love it. It looks so much better not to have that ugly trash can hanging out by the cabinets, and I’m excited to finally get to start recycling. The trash cans are still pretty small, but we’re definitely used to a small trash can so it’s no big deal – and since we’ll be recycling, the trash will be pretty evenly split, which means it’ll fill up a lot slower. So, um, yeah – trash cans definitely aren’t the most exciting thing in the world, but I’m pretty thrilled about this little upgrade. And I have to say, it’s definitely made that little corner of our kitchen look significantly better! Ahhh, so much nicer, no? 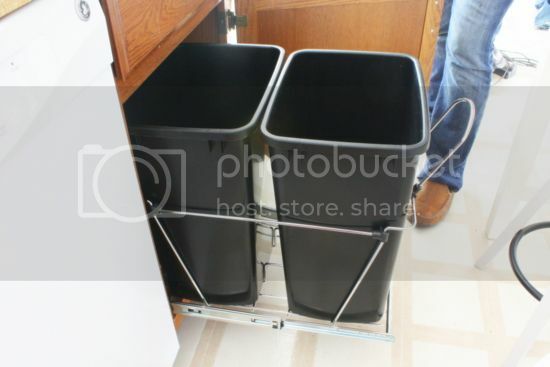 What’s the trash can situation in your home? They’re definitely one of those things that are almost never pretty – but we have to deal with ’em! Anyone have a brilliant way of hiding theirs? LOVE this project! 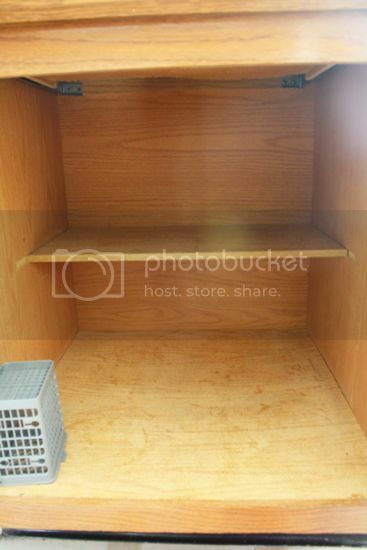 We had a pull out trash cabinet in my house growing up- it was like this, but the cabinet pulled out like a drawer – it was a built in from when we redid our kitchen. It was so handy, you will love it!!!! That’s awesome! Our new kitchen has NO natural place for a trash can, so we’d love to do this, but we’re also limited on cabinet space … It’ll be a challenge! I’ll be coming back to this post if we decide to go the cabinet route. You guys always think of the best projects! Put the recycling bin right outside your door so that you don’t have to go far to dump out that little can when it gets full—then you’ll be more likely to recycle. I put 2 trash cans in each bedroom upstairs too—one for trash and one for recycling. 🙂 We fill a huge recycling bin—like 50 gallons with paper per week. So much junk mail! 😛 Of course, last week I forgot about recycling/trash day so our bins are bursting full…I must remember to take those out tomorrow! It’s PERFECT. It’s exactly what we need to keep Zep out of the trash! !